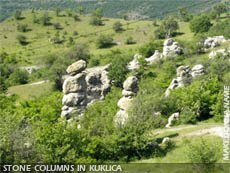 Kuklica stone town is located in the Kratovo district. According to the sources, the Kuklica stone town figures, that are known by the local population as Dolls, appears to be 10 million years old. For the existence of stone town there are many legends and myths, but the most famous is the one, according to which, the stone figures are wedding guests (people), that were cursed by the forsaken bride, and turned into a rocks. There are 120 stone figures, one by another, up to 10 meters high. The legends speak that once a upon a time, one boy from the village of Kuklica (that is above the stone town), who cannot decided whom to marry with, asked two girls. The wedding with the both of them was planned in a same day. There used to be a tradition not to have more than one wedding in each day, because the brides must not be seen each other, during their wedding - that was a bad luck. Not knowing for that one of the brides saw that there is another wedding in the same day and run out of her house to see who is getting married. When she saw her boyfriend with another girl, she cursed all of them: "Let God turn all of you into rocks, even me". And in the moment all of people got frozen and turned into rocks. According to another legend, the existence of the stone figures is very different. There used to be a wood in this area, but due to the wars it was burned down. Soon the area became nearly to a desert. When the army passed because of the low temperatures, all of the soldiers frizzed and turned into rocks. But the scientists do not agree with the legends. According to them, they were formed 10 million years ago, by the tectonic erosion, from a minerals that dissolve in water. As the time passed, the nature created master pieces. The local population says that on every 5-6 years a new figures appear.